Inertial sensors include gyroscopes (which sense rotation) and accelerometers (which sense motion in a straight line). These sensors are now pervasive, being embedded in nearly every mobile phone, tablet computer, gaming system and vehicle. The accuracy of gyroscopes and accelerometers is notoriously degraded by printed-circuit-board stress and environmental temperature changes. 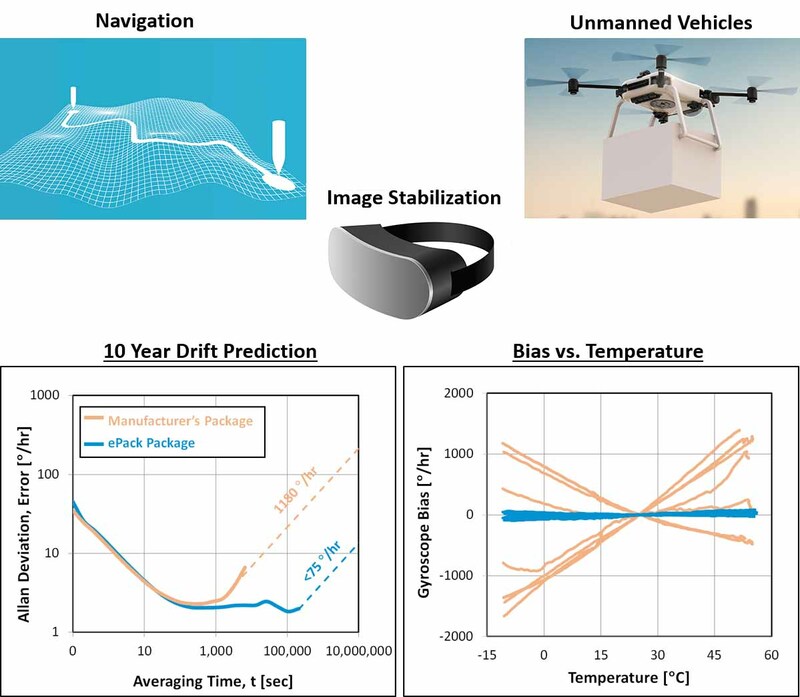 Epack’s ERP packaging eliminates these effects, boosting the performance of $1 consumer-grade inertial sensors to levels appropriate for use in precision IoT (Internet-of-Things) applications for industrial monitoring and even military-grade navigation systems. The plot on the lower left illustrates how Epack’s stress isolation eliminates the long-term drift in typical packaging (tan), enabling it to hold its ~2 °/hr stability for very long periods, with more than a 10 × improvement in predicted long-term stability (blue). The second plot shows improved performance with oven stabilization where typical packaging results in 1000 °/hr shifts in the angle rate measurement as compared to nearly flat measurements with Epack‘s low-power oven stabilization packaging.